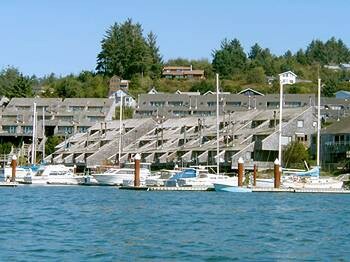 Property Location Located in Newport, Embarcadero Resort Hotel & Marina is in the historical district and minutes from Pacific Maritime and Heritage Center and Oregon Undersea Gardens. This resort is within close proximity of The Wax Works and Ripley&apos;s Believe It or Not.Rooms Make yourself at home in one of the 65 guestrooms featuring DVD players. Rooms have private patios. Complimentary wireless Internet access keeps you connected, and cable programming is available for your entertainment. Private bathrooms with shower/tub combinations feature complimentary toiletries and hair dryers.Rec, Spa, Premium Amenities Be sure to enjoy recreational amenities, including an indoor pool, a spa tub, and a sauna. Additional features include complimentary wireless Internet access, gift shops/newsstands, and wedding services.Dining Grab a bite to eat at the resort&apos;s restaurant, which features a bar, or stay in and take advantage of room service (during limited hours). Cooked-to-order breakfasts are available for a fee.Business, Other Amenities Featured amenities include a 24-hour business center, laundry facilities, and a safe deposit box at the front desk. Planning an event in Newport? This resort has 4000 square feet (360 square meters) of space consisting of conference space and meeting rooms. Free self parking is available onsite.